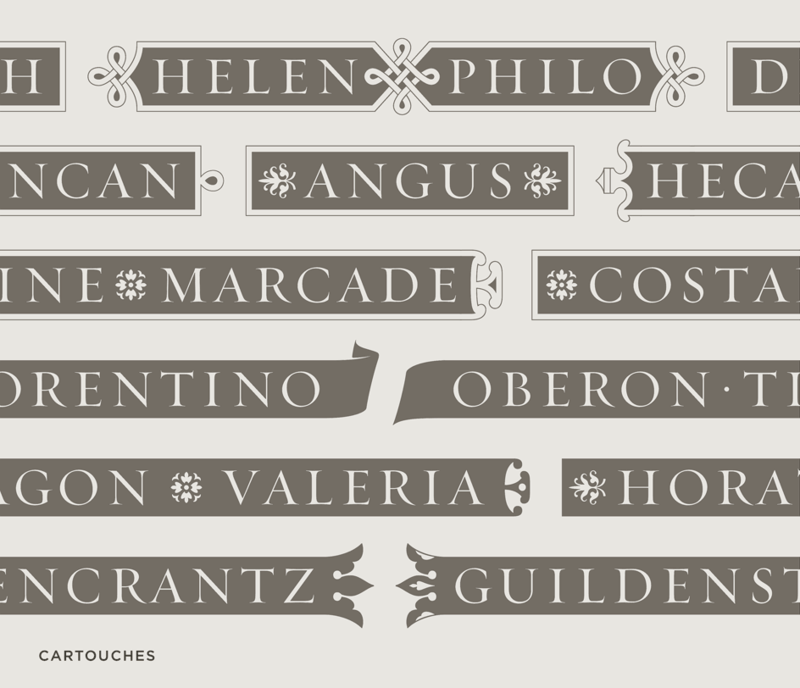 Requiem Font Features: Ornaments | Hoefler & Co. Inspired by a feature of renaissance engravings, Requiem contains a collection of self-contained “cartouche” alphabets in two different sizes, one for text and one for display. In many of the sixteenth century writing manuals, interleaved between the pages of instructional lettering were flamboyant frontispieces. A common device was to inscribe simple geometrical forms, reminiscent of renaissance façades, and embellish them with ornate mannerist details — decorative scrollwork, heraldic or architectural motifs, or stylized floral patterns. Rather than replicate their forms, or limit designers to their not especially useful proportions, Requiem includes a set of cameo alphabets contained within “cartouches,” which can be capped with a collection of different flourished endings. Also inside are a small collection of period printers’ flowers, inspired by the same sources. The Arrighi writing manual Il Modo, which inspired Requiem’s alphabet, contains few of them; these are inspired by the work of Arrighi’s contemporaries, chiefly forms in the 1554 Opera of Vespasiano Amphiareo (1501-1563), and Libro nuovo d’imparare a scrivere (1540) by Giovanni Battista Palatino (c. 1515-1575+). Optical Sizes. To preserve the typefaces’ delicate features, each of Requiem’s styles is provided in three different versions to tackle different size ranges. Ornaments. The two Requiem Ornaments fonts (one for small sizes and one for large) contain two sets of decorative “cartouche” alphabets in period style, and an assortment of printers’ flowers. Italic Ligatures. Each of Requiem’s italics includes a set of 75 decorative ligatures, which range from the familiar (fl) to the exotic (stfj) to the downright dubious (fffl). Special Characters. In every optical size, Requiem contains a wealth of decorative alternates for its romans, italics, and small caps. Language Support. Requiem features our Latin-X™ character set, covering more than 140 languages throughout the world — including all of Central Europe.